Fairy tales are a type of story which typically features fantasy characters, such as fairies, goblins, elves, trolls, dwarves, giants, mermaids, or gnomes, and usually magic or enchantments. The term is also used to describe things blessed with unusual beauty or happiness, as in a or "fairy tale romance" or "fairy tale ending" (a happy ending — though not all fairy tales end happily). Colloquially, a "fairy tale" or "fairy story" refers to any farfetched story or tall tale, especially those which seem not merely untrue, but impossible. I believe in angels, something good in everything I see. Broadly speaking, and in most cases, the fairy tale is a dramatic projection in symbolic images of the life of the psyche, and it can travel from one country to another, one culture to another culture, whenever what it has to say holds good for human nature in both, despite their differences. […] a genuine myth, like the Chaplin clown, can always be recognized by the fact that its appeal cuts across all differences between highbrow and lowbrow tastes. Some of my youthful readers are developing wonderful imaginations. This pleases me. Imagination has brought mankind through the Dark Ages to its present state of civilization. Imagination led Columbus to discover America. Imagination led Franklin to discover electricity. Imagination has given us the steam engine, the telephone, the talking-machine, and the automobile, for these things had to be dreamed of before they became realities. So I believe that dreams — day dreams, you know, with your eyes wide open and your brain machinery whizzing — are likely to lead to the betterment of the world. The imaginative child will become the imaginative man or woman most apt to create, to invent, and therefore to foster civilization. A prominent educator tells me that fairy tales are of untold value in developing imagination in the young. I believe it. L. Frank Baum, Introduction to The Lost Princess of Oz (1917). Fairy tales, then, are not responsible for producing in children fear, or any of the shapes of fear; fairy tales do not give the child the idea of the evil or the ugly; that is in the child already, because it is in the world already. Fairy tales do not give the child his first idea of bogey. What fairy tales give the child is his first clear idea of the possible defeat of bogey. The baby has known the dragon intimately ever since he had an imagination. What the fairy tale provides for him is a St. George to kill the dragon. Exactly what the fairy tale does is this: it accustoms him for a series of clear pictures to the idea that these limitless terrors had a limit, that these shapeless enemies have enemies in the knights of God, that there is something in the universe more mystical than darkness, and stronger than strong fear. G. K. Chesterton, in Tremendous Trifles (1909), XVII: "The Red Angel"
Variant: Fairy tales are more than true — not because they tell us dragons exist, but because they tell us dragons can be beaten. Variant: Fairytales don’t tell children that dragons exist. Children already know that dragons exist. Fairytales tell children that dragons can be killed. The dogmas we really hold are far more fantastic, and, perhaps, far more beautiful than we think. In the course of these essays I fear that I have spoken from time to time of rationalists and rationalism, and that in a disparaging sense. Being full of that kindliness which should come at the end of everything, even of a book, I apologize to the rationalists even for calling them rationalists. There are no rationalists. We all believe fairy-tales, and live in them. Some, with a sumptuous literary turn, believe in the existence of the lady clothed with the sun. Some, with a more rustic, elvish instinct, like Mr. McCabe, believe merely in the impossible sun itself. Some hold the undemonstrable dogma of the existence of God; some the equally undemonstrable dogma of the existence of the man next door. Even the tyrant never rules by force alone; but mostly by fairy tales. And so it is with the modern tyrant, the great employer. When I was ten, I read fairy tales in secret and would have been ashamed if I had been found doing so. Now that I am fifty I read them openly. When I became a man I put away childish things, including the fear of childishness and the desire to be very grown up. I would not for any quantity of gold part with the wonderful tales which I have retained from my earliest childhood, or have met with in my progress through life. Were I asked, what is a fairytale? 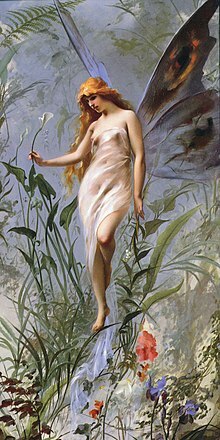 I should reply, Read Undine: that is a fairytale ; then read this and that as well, and you will see what is a fairytale. Were I further begged to describe the fairytale, or define what it is, I would make answer, that I should as soon think of describing the abstract human face, or stating what must go to constitute a human being. A fairytale is just a fairytale, as a face is just a face; and of all fairytales I know, I think Undine the most beautiful. George MacDonald‎, in "The Fantastic Imagination" (1893), a Preface to an American edition of MacDonald's Complete Fairy Tales . "Suppose my child ask me what the fairytale means, what am I to say?" If you do not know what it means, what is easier than to say so? If you do see a meaning in it, there it is for you to give him. A genuine work of art must mean many things; the truer its art, the more things it will mean. If my drawing, on the other hand, is so far from being a work of art that it needs THIS IS A HORSE written under it, what can it matter that neither you nor your child should know what it means? It is there not so much to convey a meaning as to wake a meaning. If it do not even wake an interest, throw it aside. A meaning may be there, but it is not for you. If, again, you do not know a horse when you see it, the name written under it will not serve you much. A fairytale is not an allegory. There may be allegory in it, but it is not an allegory. He must be an artist indeed who can, in any mode, produce a strict allegory that is not a weariness to the spirit. A fairytale, like a butterfly or a bee, helps itself on all sides, sips at every wholesome flower, and spoils not one. The true fairytale is, to my mind, very like the sonata. We all know that a sonata means something; and where there is the faculty of talking with suitable vagueness, and choosing metaphor sufficiently loose, mind may approach mind, in the interpretation of a sonata, with the result of a more or less contenting consciousness of sympathy. The best thing you can do for your fellow, next to rousing his conscience, is — not to give him things to think about, but to wake things up that are in him; or say, to make him think things for himself. The best Nature does for us is to work in us such moods in which thoughts of high import arise. Does any aspect of Nature wake but one thought? Does she ever suggest only one definite thing? Does she make any two men in the same place at the same moment think the same thing? Is she therefore a failure, because she is not definite? Is it nothing that she rouses the something deeper than the understanding — the power that underlies thoughts? Does she not set feeling, and so thinking at work? Would it be better that she did this after one fashion and not after many fashions? Nature is mood-engendering, thought-provoking: such ought the sonata, such ought the fairytale to be. I hate good wizards in fairy tales; they always turn out to be him. Steven Moffat, in The Pandorica Opens (19 June 2010), lines written for River Song. I'm in love with a fairytale, even though it hurts. 'Cause I don't care if I lose my mind; I'm already cursed. Believable fairy-stories must be intensely practical. You must have a map, no matter how rough. Otherwise you wander all over the place. In The Lord of the Rings I never made anyone go farther than he could on a given day. The reader must approach Faerie with a willing suspension of disbelief. If a thing can be technologically controlled, it ceases to be magical. I have a duty to my people and that is something you can never understand. I loved living in Louisiana and I wish my life could be like this everyday. But this is not reality. You think my life as a princess is some fairytale? This here is a fairytale and I cannot hide here anymore. Soon I'll be queen of Costa Luna. My country needs me. The nature of fairy tales is to evolve over time and to portray eternal themes that resonate with people of all cultures and time periods. Fairy tales and more fairy tales. Albert Einstein in response to a mother who wanted her son to become a scientist and asked Einstein what reading material to give him. Found in Montana Libraries: Volumes 8-14 (1954), p. cxxx. The story is given as follows: "In the current New Mexico Library Bulletin, Elizabeth Margulis tells a story of a woman who was a personal friend of the late dean of scientists, Dr. Albert Einstein. Motivated partly by her admiration for him, she held hopes that her son might become a scientist. One day she asked Dr. Einstein's advice about the kind of reading that would best prepare the child for this career. To her surprise, the scientist recommended 'Fairy tales and more fairy tales.' The mother protested that she was really serious about this and she wanted a serious answer; but Dr. Einstein persisted, adding that creative imagination is the essential element in the intellectual equipment of the true scientist, and that fairy tales are the childhood stimulus to this quality." However, it is unclear from this description whether Margulis heard this story personally from the woman who had supposedly had this discussion with Einstein, and the relevant issue of the New Mexico Library Bulletin does not appear to be online. Variant: "First, give him fairy tales; second, give him fairy tales, and third, give him fairy tales!" Found in The Wilson Library Bulletin, Vol. 37 from 1962, which says on p. 678 that this quote was reported by "Doris Gates, writer and children's librarian". Variant: "Fairy tales … More fairy tales … Even more fairy tales". Found in Breaking the Magic Spell: Radical Theories of Folk and Fairy Tales by Jack Zipes (1979), p. 1. Variant: "If you want your children to be brilliant, tell them fairy tales. If you want them to be very brilliant, tell them even more fairy tales." Found in Chocolate for a Woman's Heart & Soul by Kay Allenbaugh (1998), p. 57. This version can be found in Usenet posts from before 1998, like this one from 1995. Variant: "If you want your children to be intelligent, read them fairy tales. If you want them to be very intelligent, read them more fairy tales." Found in Mad, Bad and Dangerous? : The Scientist and the Cinema by Christopher Frayling (2005), p. 6.